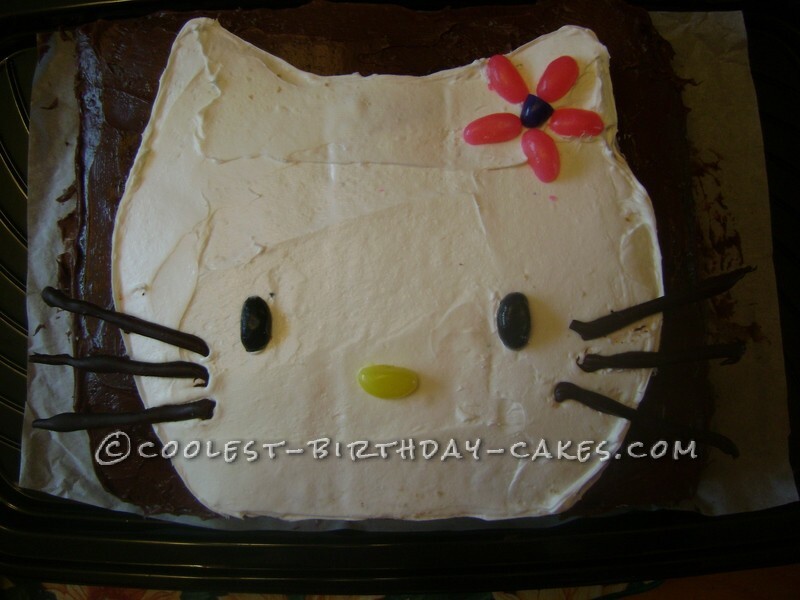 This Hello Kitty Cake was my first fantasy cake, made for my daughter’s 6th birthday. I baked 2 round cakes and a sheet cake. I first frosted the sheet cake in a contrasting color. I then cut one round cake in half, and the other into thirds. I took the middle (longest) third and inserted it between the first cake’s two halves in order to get a more oblong shape for Kitty’s head. I cut her ears from the two leftover thirds. I put Kitty on the sheet cake, and frosted her in white butter cream. Her whiskers were made by melting and piping chocolate onto some parchment paper. They wilted, so I would use fondant or chocolate pretzel sticks next time. The eyes, nose and bow are halved jelly beans. So cute and much loved by my daughter and her friends! Because it was so easy to make, it inspired me to keep making creative cake designs, impressing friends, family and most of all myself!